Yesterday, I went on the newly-opened Lekki-Ikoyi bridge for the very first time. Yes, the N250 toll was more than double what I would have paid on the Lekki-Epe toll road but my journey time was more than halved. Many have kicked against tolling infrastructure that was built with taxpayers’ money and there may well be some merit in that argument. A suit has been filed against the Lagos State Government in this regard and we will have a judicial pronouncement on the matter soon enough. In the meantime, here are 5 reasons why I think the road should be tolled. Apart from revenue, tolling also serves to control drivers’ behavior. Take the Congestion Charge in Central London, for instance. More than anything else, the toll was introduced to reduce the number of people driving themselves into London’s central business district. Call this elitist if you like, but we can’t have the whole world driving through the primest of the prime real estate in South-Western Nigeria. The toll is low enough to be practical for the residents of the newly connected vicinities yet high enough to prevent it from becoming the world’s thoroughfare. The Government of Lagos State is led by a Senior Advocate of Nigeria. Now, yes, this is an ad hominem but the chances are that pacta sunt servanda will mean a whole lot more to them than the Federal Government. Unlike the unlearned Federal Government, which has failed to honour most of its obligations under the BiCourtney airport concession (e.g. closing down the general terminal and moving all domestic operators to the Concessionaire-operated wing), Lagos State will be keen not to create another alternative route to the Admiralty Toll Plaza. I haven’t seen the Lekki-Epe Concession Agreement but any lawyer worth their money (and intent on protect his client’s money) would have protected his client by restricting the creation of more than one alternative route. If you live in Lekki, you can now get to the Third Mainland Bridge in less than 10 minutes. Even Vin Diesel would struggle to do that with a souped up car on the Ozumba route, given the toll plaza, the traffic lights, the numerous intersections etc. And that’s even on a Sunday morning with little or no traffic. Time is still money in 2013, right? 4. Have You Been on the Bridge at Night? No really, have you? The bridge is a work of art. I overheard someone describe the drive at night as “almost sexual”. Now I don’t know anything about that, but I guarantee that a few marriage proposals (as well as many ulterior ones) will be sealed with a walk or a drive on that bridge. This is more wishful thinking than anything else, but if Lekki is now only 3 minutes away from Ikoyi, should Ikoyi rentals still have a 50% (or more) markup on similar housing units in Lekki? I think not. Then again, with all the empty houses in Lekki, should there be a 40% (or more markup) on Agungi downwards? No? So what was my fifth point again? ← What’s A State of Emergency Anyway? I totally agree if we even we are going to over pay, as long the infrastructure is well maintained. Eventually prices may come down. Lagos state governnent should not only focus on the Lekki axis’s only. If only electricity issue can be tackled this way. Nigerians should stop complainjng about services which they readiky pay to get abroad. Pretoria to polokwane in South Africa is only 6 hour dtive round trip. It cost 500Rand to go thruog the toll gates both ways. That’s about 10, 000Naira and we pay. They complain about energy charges and the average charge per month in South Africa is 1, 500Rand. Thats some 30, 000Naira monthly. And they keep saying South Africa is good and yet the services we get at home we’re not ready to pay. 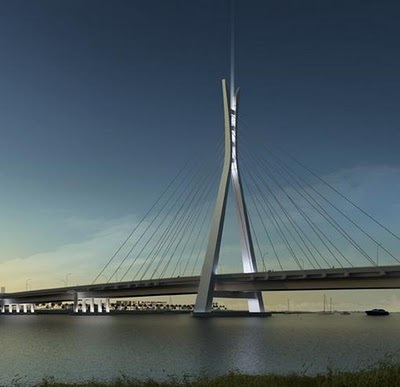 250naira for a bridge like the lekki – Ikoyi bidge is too little considering the gains. We shoild be willing to pay for services.